An acclaimed video artist and musician, New York artist Christian Marclay is a pioneer in incorporating sound and video into visual art practice. Marclay has long been fascinated by the material remnants of popular culture—among them, film clips, thrift store vinyl, album covers and classic comic strips. Marclay’s practice has been linked to sources as diverse as Dada artist Marcel Duchamp’s idea of the readymade art object and avant-garde composer John Cage’s interest in found sound. Other major influences include the performance artist Joseph Beuys and the 1980s punk rock band scene. 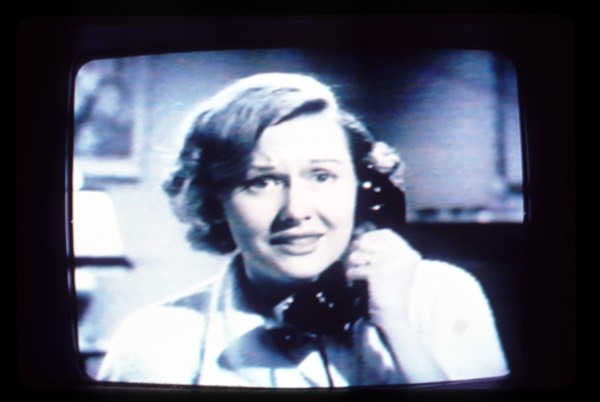 For Telephones, Marclay drew upon Hollywood film archives to create a 7-minute video montage. An array of human encounters with the telephone is woven from a diverse group of familiar images. A phone rings and is approached with anxious expectation, fear, boredom, desire or anger. The players are strangers, or known to us as Cary Grant, Barbara Stanwyck, Ray Milland and other iconic screen actors. The visual experience is augmented by Marclay’s sound editing, which creates a collage that brings attention to how the ring of the telephone forces our attention, the oddities of telephone etiquette and the artifice of television and movie conversation patterns.